I first made homemade marshmallows for Christmas a few years ago. They were amazing and I absolutely adored them floating in a mug of cocoa. And while vanilla marshmallows have been my go-to, I kept dreaming about chocolate ones. 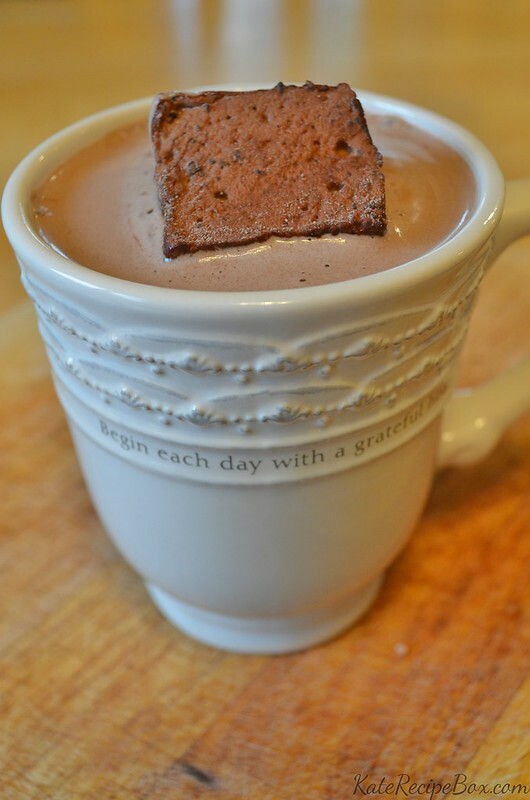 Fluffy chocolate marshmallows floating in rich chocolate cocoa. Sounds heavenly, right? It took a few tries to figure out how to make it work – trying to mix in cocoa powder never gave me the result I was hoping for but mixing the cocoa powder into a chocolate paste makes them just right. 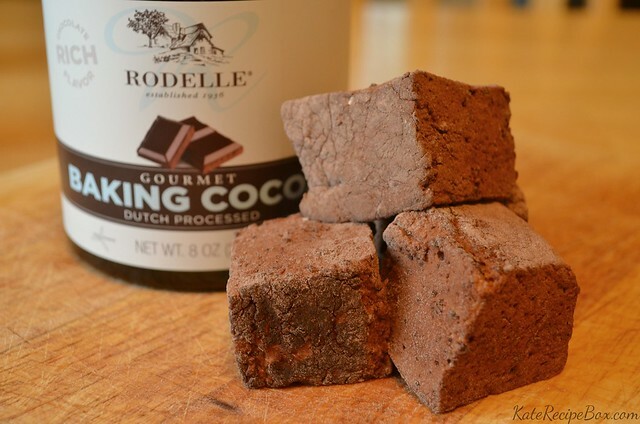 I used gourmet baking cocoa from Choctoberfest sponsor Rodelle for this and it was such a great choice – the rich flavor is perfect for decadent marshmallows! 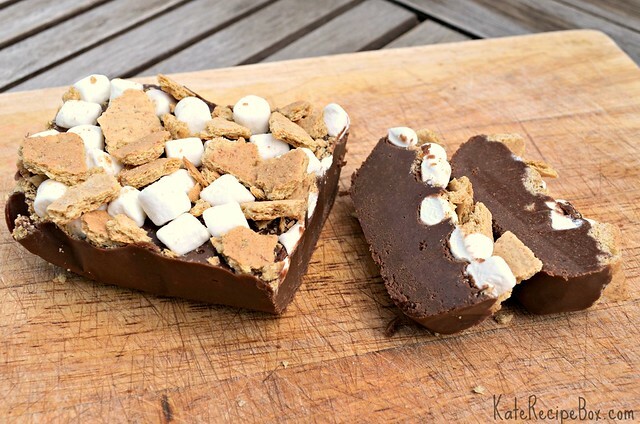 As we were sampling these, Jake requested making them into s’mores using chocolate graham crackers too – I’m pretty sure that will be our next project! In a bowl, sift together the powdered sugar, cornstarch, and 1/4 c. cocoa powder. Oil an 8×8″ baking pan with vegetable oil and then dust with powdered sugar mixture. Mix remaining 1/4 cup cocoa powder and 2 Tbsp. hot water to make a paste. In another bowl, put 1/2 cup cold water and sprinkle gelatin over. Set aside. In a saucepan with a candy thermometer, combine the sugar, corn syrup and 1/2 cup of water. Bring to a boil and then reduce heat to medium. Cook until it reaches 240 degrees then remove from heat. In the bowl of a stand mixer, add the gelatin mixture and beat for a minute, until broken up. Add the chocolate paste and beat until well incorporated. While the mixer is going, slowly pour the corn syrup mixture in. Beat on high for about 15 minutes, until thick and doubled in size. Pour the batter into the prepared pan and cover top with more of the cornstarch mixture. Set aside overnight. The next day, invert the pan to remove the marshmallows. Cut into squares and then roll in remaining cornstarch mixture to coat all sides. Stir in an airtight container. I’ve been in full-on declutter mode lately. My closet got a thorough purge a few weeks ago. Jake’s clothes got a big reorganization with all of his now-too-small things packed up into space bags into the basement. And this week, I’ve been working on the refrigerator and pantry. There are a lot of things I just need to use up (or accept that I won’t and throw them out). I realized I had two, half-full containers of chocolate icing the other day. Which automatically meant I needed to try another version of the Reese’s fudge I posted last week. And in the pantry, I found some white chocolate peanut butter and leftover ingredients from the S’more Pizza. S’mores Fudge was the obvious choice. It came out delicious – Mark and I both agreed we liked this version better! Line a small loaf pan with parchment. Pour the chocolate mixture into the prepared loaf pan. Sprinkle mini marshmallows and crushed graham crackers over the top and press in slightly. Refrigerate for several hours before slicing and serving. Store covered in the refrigerator.